Diesel-powered F-150 test trucks have been spotted running around Ford's product development center in Dearborn, Mich.
Ford Motor Co. appears to be gearing up to launch a diesel-powered version of the F-150, possibly as early as next year, and wrest the fuel efficiency crown from the hot-selling Ram 1500 EcoDiesel. 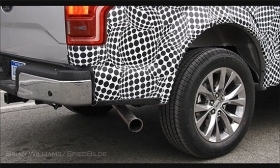 Diesel-powered F-150 test trucks have been spotted running around Ford’s product development center in Dearborn, Mich.
Land Rover’s decision to equip its Range Rover and Range Rover Sport SUVs with a Ford-built, 3.0-liter diesel engine also bodes well for a diesel-powered F-150. Ford spokesman Mike Levine declined to comment on Ford’s future products, but Dave Sullivan, an analyst for consulting firm AutoPacific, says Ford’s product plans call for a diesel-powered F-150 teamed with a new 10-speed automatic transmission co-developed by Ford and General Motors. It could launch as a 2017 model, he says. “A diesel F-150, with its lightweight body and 10-speed automatic, would have all of the necessary hardware to win the fuel economy race,” said Sullivan. When the redesigned, aluminum-bodied F-150 arrived in late 2014, the fuel economy ratings disappointed many consumers and analysts who expected the lightweight truck to be the most fuel efficient in the segment. The most fuel-efficient F-150 is powered by a 2.7-liter V-6 that carries a 19 mpg city and 26 mpg highway EPA fuel economy rating. Ram’s EcoDiesel 1500 carries a 29 mpg highway rating. The Ram EcoDiesel has been a big success for Fiat Chrysler, accounting for 15 percent of Ram 1500 sales in the U.S. The diesel engine likely to go in the F-150 is a 3.0-liter, twin-turbo V-6 made in Ford’s Dagenham, England, plant. It traces its roots to 1999 and a deal Ford made with French manufacturer Peugeot. Part of the Lion engine family co-developed by Peugeot and Ford, the V-6 diesel, originally 2.7 liters, has been used in Peugeots, Jaguars, Land Rovers and the Ford Territory, an off-road vehicle made in Australia. The newest diesel-powered Range Rovers offer a good indication of the power, performance and fuel economy an F-150 with the same engine would offer. In its current state of tune in the Range Rover Sport, the 3.0-liter V-6 develops 254 hp and delivers 440 pounds-feet of torque at 1,750 rpm. The 4,727-pound Range Rover Sport carries an EPA fuel economy rating of 22 city/29 highway. It uses an eight-speed automatic. The 2016 F-150 Lariat Crew Cab weighs 4,942 pounds, and its aerodynamic performance would be comparable to the Range Rover’s. The Ram EcoDiesel is rated at 240 hp and 420 pounds-feet of torque at 2,000 rpm, suggesting the Ford 3.0-liter diesel could be installed in the F-150 with little modification. “I am sure federalizing the engine and sourcing common parts helps bring the cost down,” said Sullivan. He thinks Ford could easily sell around 45,000 diesel-powered F-150s per year. Ford says the F-150 has been the nation’s top-selling vehicle for 34 years and top truck for 39 years. If Ford does launch a diesel-powered F-150, it will be closing a gap in its light-duty truck lineup, as Ram, Chevrolet and GMC sell light-duty diesel trucks and Nissan just launched a diesel on the Titan.